Invacare Reliant 450 battery-powered lift is designed to reduce the possibility of caregiver back injury and to ensure dignity in resident handling. Reliant high-quality lift offers comfortable, reliable and integral tools to caregivers for additional support. 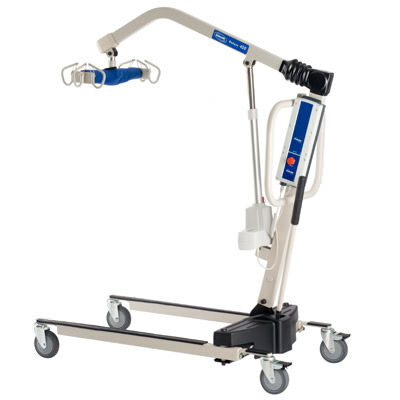 Reliant power lift supports up to 450 lbs., makes potentially challenging transfers smooth for the resident and caregiver. Reliant high lift range allows easy access to chairs, commodes, floors and beds (with at least 4.5" under-bed clearance). Reliant 450 power lift has sturdy and practical design which provides safe and effective health care. Invacare Reliant 450 power lift comes with low friction casters that improves rollability and contribute to caregiver safety. Reliant 450 power lift offers electronic system that includes two 24-volt batteries in which one for lift, one for battery-charging station, a manual emergency lowering device and an anti-entrapment which feature if boom meets any resistance while lowering. Reliant 450 lift has quick-release battery pack which eliminates downtime and simplifies the charging process. Reliant RPL450-1 power lift comes with padded swivel bar with 360° rotation and six-point hook-up allows use of Invacare chain-free slings as well as older style slings with chains or straps. Invacare RPL450-1 power lift features covered base which provides protection against wear, dirt and moisture and base legs that adjust easily and lock securely into open position with the padded shifter handle. Reliant power lifting aid provides multi-grip push handle that is angled to minimize wrist strain and total pinch-point protection covers all moving parts for added safety. Charging station - UL listed and CSA certified battery which can be replaced immediately with second battery in wall-mounted charger. Electronics - Removable battery box conveniently located on mast features an emergency off button and beeps when battery needs recharged. Hand pendant - Ergonomic control with heavy-duty cord and convenient pendant hook that allows attachment and storage on multiple areas of lift. Invacare reliant digital scale - Easy to operate, four-button display and retrofits on all Reliant 450/600 lifts. Automatic shut-off feature prolongs battery life. Manual lowering - Manual emergency lowering is easy and effortless which gently and safely lowers resident in case of total power loss. Simply insert the end of a ball point pen into the hole marked "emergency" or lift on the accessible ring-pull. Height at sling hook up 24" - 74"